(Pictures are stock photo and item may vary slightly). 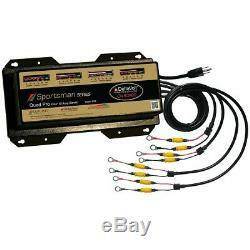 Dual Pro Sportsman Series Battery Charger - 40A - 4-10A-Banks - 12V-48V. Dual Pro SS4 Battery Charger. Approved for Wet Cell and AGM batteries. Models also available for Gelled Electrolyte batteries. Designed for use in fresh and saltwater. Fully automatic / multi stage charging. Battery systems available: 12V - 48V. LED lights indicate the state of charge. FCC 15 Parts A & interference compliant. DC charge cables = 5ft. AC power cord = 3ft. Approved and meets ISO 8846 Marine standards. Ignition protected (US Coast Guard 33 CFR 183.410). Our customers asked for a series of chargers that were smaller, lighter and economically affordable. The Sportsman Series of chargers answers these needs. This line of chargers is designed for all types of battery applications. Sportsman chargers have all the safety and reliability features that have made PRO Charging Systems chargers the #1 choice of most boat manufacturers, dealers and over 750,000 customers across the country. Advanced microprocessors and LED readings make the units even easier to use. 4.75"H x 8.00"W x 14.25L. Pounds: 24.00 Ounces: 0.00 Package Depth: 10.00 Inches Package Length: 14.00 Inches Package Width: 11.00 Inches. Orders are automatically processed through our system. Please make sure your address is correct at checkout and you are certain of what you are ordering. Orders are not always able to be canceled once processed. For the rare occasion you have an issue with an item you received. We will take care of your request ASAP. Wake Zone Marine is a Limited Liability Corporation. We have added additional cost for these areas. Please assume all electrical items are made to work on 120V or 12V systems unless otherwise noted in the description. Please inquire with us in case this is not acceptable and we may make an exception. Please check with local officials regarding cost and proper procedures for labeling. Item must be Brand New in box, no exceptions. We cannot return any installed, used, broken parts unless they are non-working upon arrival. Map cards are NON returnable. Most items we sell are covered by manufacturers' warranties. Some of the products on this website can expose you to chemicals including lead, which is known by the State of California to cause cancer and reproductive harm. For more information please go to. Powered by SixBit's eCommerce Solution. The item "Dual Pro Sportsman Series 40A 4 Bank Battery Charger" is in sale since Friday, October 20, 2017. This item is in the category "Consumer Electronics\Other Consumer Electronics". The seller is "wakezonemarine" and is located in Bayville, New Jersey. This item can be shipped to United States, Canada, United Kingdom, Denmark, Romania, Slovakia, Bulgaria, Czech republic, Finland, Hungary, Latvia, Lithuania, Malta, Estonia, Australia, Greece, Portugal, Cyprus, Slovenia, Japan, Sweden, South Korea, Indonesia, Taiwan, Thailand, Belgium, France, Ireland, Netherlands, Poland, Spain, Italy, Germany, Austria, Bahamas, Philippines, Norway, Ukraine, Croatia, Malaysia, Colombia, Costa rica, Antigua and barbuda, Aruba, Belize, Dominica, Grenada, Saint kitts and nevis, Saint lucia, Montserrat, Turks and caicos islands, Barbados, Bangladesh, Bermuda, Brunei darussalam, Bolivia, Ecuador, Egypt, French guiana, Guernsey, Gibraltar, Guadeloupe, Iceland, Jersey, Jordan, Cambodia, Cayman islands, Liechtenstein, Sri lanka, Luxembourg, Monaco, Macao, Martinique, Maldives, Nicaragua, Oman, Peru, Pakistan, Paraguay, Reunion, Viet nam, Uruguay, China, South africa, New Zealand, Singapore, Switzerland, United arab emirates, Qatar, Kuwait, Bahrain.